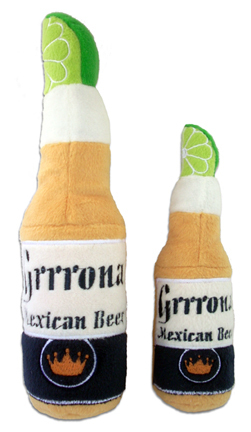 When Buddy’s had a tough day at work dreaming up new pet products, he likes to settle in with a nice cold one—a Grrrona beer bottle toy that is. This chew toy isn’t the toughest toy on the market, but it is the one that’s best for making your dog feel likes it’s a part of your next party. This entry was posted on Friday, September 30th, 2011 at 1:13 PM. It is filed under Blog. You can follow any responses to this entry through the RSS 2.0 feed.